Hooray! We're so glad you want to visit! Ring the Noisebridge doorbell and wait a few minutes, someone will probably buzz you in. If no one answers, you can ring again after a bit but please be patient - someone has to get up from hacking to answer the door. There is a staircase and an accessible elevator. Try to take the stairs if you can. If taking the stairs, go all the way to the top and ring the doorbell there again. The elevator can be a little persnickety but it has a bell that rings up into the space for assistance if needed. Read more about Accessibility. Read up on Getting Here. 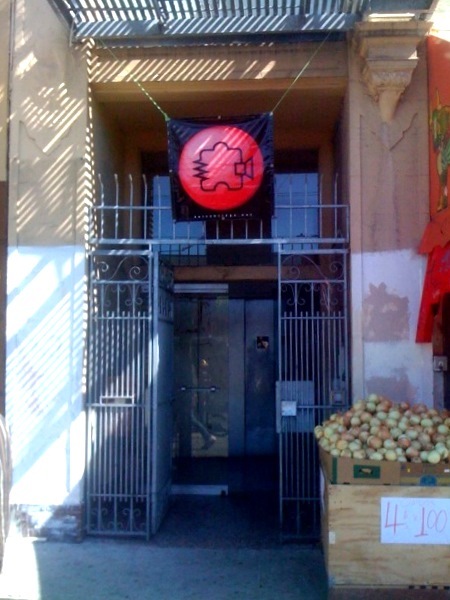 Noisebridge is a space that has been designed since its inception to be open to pretty much all hackers. We especially welcome those who like to tinker and hack on things, and those who are generally nice. Read here for more Visitor advice on our culture and some suggestions on how to interface with it. Our collectivist Do-ocracy -style anarchy is often strange to people who are accustomed to more authoritarian structures, and many new visitors are initially confused on how things work or who they should talk to about things. If it's your first time here, ask the person who let you in, or other friendly looking people for a tour! This can be a great way to jump into the Noisebridge culture and learn more about how we work. Noisebridge is most fun if you bring a project or project idea to work on. How Do I Get Into 2169 Mission? If you've never been to the space before, press the Doorbell and wait. There is generally someone available to answer the door when Noisebridge is open. Good times to catch us our in the evenings during the week, and 11am-10pm on weekends. Other times we may be open but it's not peak hours. Some people who are regulars get an RFID Token, they can enter without using the doorbell. Some of the RFID tokens give you 24/7 access, whereas entrance via doorbell generally only works during our open hours (roughly 11am-10pm). This page was last edited on 16 November 2017, at 02:38.